Property Info: 2 Bedroom, 2 Bathroom Beach Home with 1000+ sq. 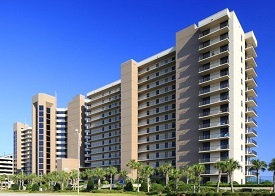 ft.
Phoenix X condominium home, Orange Beach real estate sales. Beautiful 2bd unit in Phoenix X. Complex is situated on the Florida Alabama State Line, right next to Florabama. Unit is a must see with gorgeous views of the Gulf of Mexico. Come see this resort home at Phoenix X Condos in Orange Beach AL.